The examination of the movement and interaction of mechanical energies across the atmosphere, published Jan. 24 in the journal Nature Communications, is the first to explore long-term variations of the Lorenz energy cycle—a complex formula used to describe the interaction between potential and kinetic energy in the atmosphere—and offers a new perspective on what is happening with global warming. "It is a new way to look at and explain what people have observed," said Liming Li, assistant professor of physics at the University of Houston and corresponding author of the paper. "We found that the efficiency of Earth's global atmosphere as a heat engine is increasing during the past four decades in response to climate change." In this case, increased efficiency isn't a good thing. It suggests more potential energy is being converted to kinetic energy—energy that is driving atmospheric movement - resulting in a greater potential for destructive storms in regions where the conversion takes place. "Our analyses suggest that most energy components in the Lorenz energy cycle have positive trends," the researchers wrote. 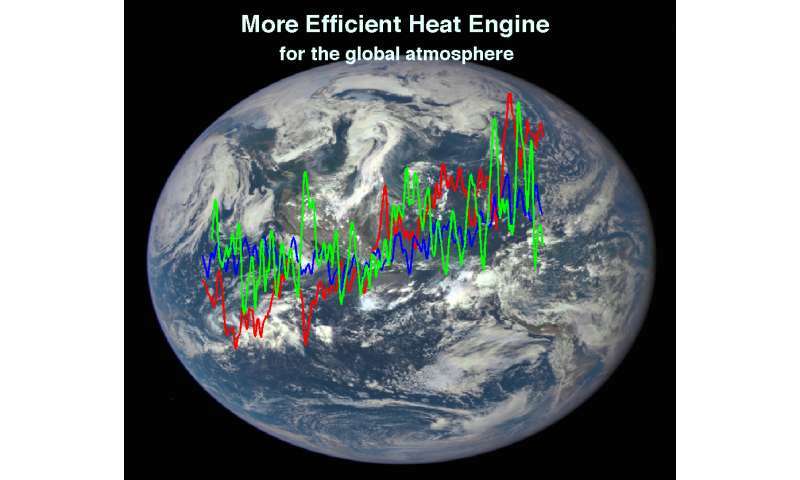 "As a result, the efficiency of Earth's global atmosphere as a heat engine increased during the past 35 years." Previous studies have covered only five-year and 10-year periods before 1973, Li said. "Now we can investigate the Lorenz energy cycle of the global atmosphere during the past 35 years, using satellite-based observations," he said. While the researchers reported that the total mechanical energy of the global atmosphere remains constant over time, there has been a significant increase in what they describe as "eddy energies," or the energies associated with storms, eddies and turbulence. "This is a new perspective to explain global warming from an energy standpoint," he said. "The more frequent and more dangerous storms" .... what evidence is there for any of this? North American weather, at least, has (if anything) been less violent since about 2005 (Hurricane Katrina, a Cat 2-3 storm at New Orleans, was the last major coastal event). The strongest storms on record for this continent all took place decades ago. And the increased warming that supposedly accounts for the supposed storm intensity ... where is it? The temperature records, prior to several rounds of "adjustments," showed no warming to speak of after 1998. It took the very powerful El Nino of 2014-2016 to raise temps back to the level of the late '90s. Both the '90s El Nino event and the latest one only took temps to roughly the same level as in the 1930s. If you want to dispute this, please don't quote insurance industry statistics. They only show that increasing population density boosts losses, and dollar devaluation makes the losses appear bigger. Anonym, the article explains the studies that provide the evidence you claim is lacking. Meanwhile, you supply no basis for your wild assertions whatsoever. Your bleating contributes nothing. Just shut your stench hole. Researchers know that more, and more dangerous, storms have begun to occur as the climate warms. More Alternative Facts from the AGW Cult and their Pathological "science". Where the fuq you getting your data? Since the Katrina was sited by one of the Denier goons using all of their voodoo-math and hocus-pocus, the whole point of science is to use logic to predict the next X where X is the subject of study. The scientific method is simply "observation, measurement, and experiment, and the formulation, testing, and modification of hypotheses." (from google) applied to a subject. Simple aye? Denier goons are basically idiots. They can't even hold a job but they want to complain about goofy stuff and blame *Liberal* media for all of their wose. So denier's what are your observations of you local weather (Better, same, worse)? The disaster of Katrina is interesting in that it was predicted as potentially one of the largest disasters years before Katrina struck. Here is a 7min video from PBS years before Katrina predicting that disaster. How often have there been tornados in January? Earth's climate system is a GLOBAL DYNAMICS; wherein oscillations/patterns in ocean/air temps/currents vary across time/positions as that dynamics dictates. Beware using local/regional data over limited time/geography extents WITHOUT INTEGRATING said data into GLOBAL dynamics/processes. Done correctly, you will realize that parts of the world have experienced what the above article points to; while other parts have experienced less of it...HOWEVER, over the decade it is averaged out and TRENDING GLOBALLY more frequent/extreme! For example Queensland (and other Australian states) have been experiencing more frequent/extreme climatic 'unusual events' practically 'non-stop' for the last few years! See? Swings and Roundabouts....but TRENDING more frequent/extreme 'unusual events'. One thing that confounds stupid people who fail to see even the most obvious patterns may be the effect of petroleum spillage on cyclonic activity. Remember how Christ stood up in a small storm-tossed boat and calmed the water with "holy oil"? Throwing the oil out as far from the little ship as possible hastened the deployment of the oil monolayer that does indeed calm storms, killing winds. Look on youtube see for yourselves. Christ wasn't stupid. He went to school in Alexandria, Egypt, where there was a substantial Jewish community, where the library was/had been. Ben Franklin wrote a paper on oil on ponds he threw out in an identical way. Oil was hand wrought in pre-industrial revolution days that Franklin endured, so it was precious indeed. We have more or less gotten oil spills under control, so expect more cyclones.